RAF Culmhead is a former Royal Air Force station, situated at Churchstanton on the Blackdown Hills in Somerset, England. It had 3 tarmac runways that are now in poor condition and the control towers are currently derelict. There is now an industrial estate - derived from the later Composite Signals Organisation Station (CSOS) - right in the middle of the place where the 3 runways meet. RAF Culmhead was a typical three-runway fighter airfield, with blast pens built around the site along with ten blister hangars. It was used by fighters from RAF Exeter from June but officially opened on 1 August 1941. Ground defence was provided by the Somerset Light Infantry. The airfield was occupied by No. 2 Polish Wing of the Polish Air Force. The first squadrons to arrive were No. 316 (Warsaw) and No. 302 (Poznań) equipped with Hawker Hurricane Mk.Is. No. 302 soon left to be replaced with No. 306 (Torun) who operated Spitfires. In the summer of 1942 the polish squadrons were replaced by No. 313 and No. 312 Squadrons which were Czechoslovakian-manned. The site was also used for the testing of barrage balloon wire cutters in 1942 by 02 Detachment of the Royal Aircraft Establishment from Farnborough. In 1943 the Czech units were replaced with No. 66 and No. 504 (City of Nottingham) Squadrons. RAF Culmhead was initially known as RAF Church Stanton, but it was renamed on 22 December 1943 to avoid confusion with RAF Church Fenton. It was then used by No. 165 and No. 131 (County of Kent) Squadrons. In 1944 the Royal Navy's 24th Naval Fighter Wing took over with 894 and 897 Naval Air Squadrons using Culmhead as a location for their Supermarine Seafires, which were a naval version of the Supermarine Spitfire specially adapted for operation from aircraft carriers. After D-Day in 1944, the airfield was used for training on Gloster Meteors, the first jet engined aircraft in RAF service. No. 616 Squadron RAF tested them Culmhead before deploying them for their first operational sortie on 27 July from RAF Manston when it intercepted V-1 flying bombs launched against southern England. In the autumn of 1944 the surviving squadrons were transferred to other sites and the station wound down, becoming a glider training school and maintenance unit until RAF Culmhead closed in August 1946. From the 1950s, the site was partially re-used as Composite Signals Organisation Station (CSOS) Culmhead, performing signals research functions, operated under the aegis of Government Communications Headquarters (GCHQ), with a cluster of buildings covering some 4.4 hectares being constructed approximately in the centre of the former airfield. It was closed in this role in 1999. Several of the control towers and fighter pens have been designated as Scheduled Ancient Monuments and are included in the Heritage at Risk Register produced by English Heritage. There is currently an industrial estate at the centre of the site. 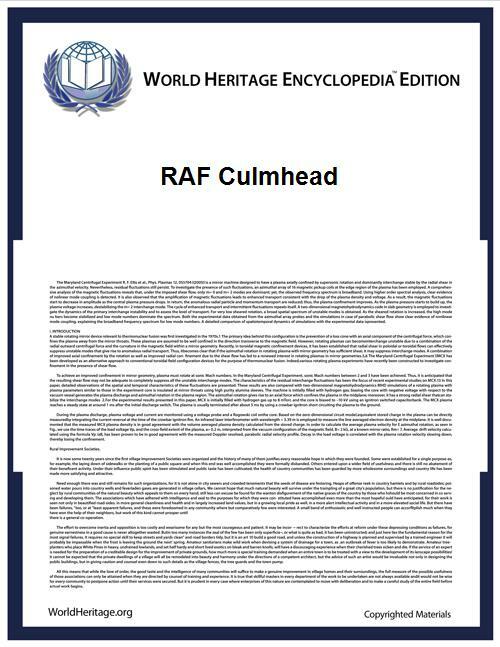 ^ a b c d e f "RAF Culmhead". South West Airfields Heritage Trust. Retrieved 22 January 2011. ^ a b c d "Culmhead airfield, Trickey Warren". Somerset Historic Environment Record. Somerset County Council. Retrieved 2009-07-25. ^ a b c d Berryman, David (2006). Somerset airfields in the Second World War. Newbury: Countryside Books. pp. 50–86. ^ "South West England". Heritage at Risk. English Heritage. p. 190. Retrieved 30 June 2010.